As the holiday season is set to start, Northern Ireland Fire & Rescue Service (NIFRS) is urging everyone to be fire aware and to follow key safety advice to stay safe this summer. “Summertime carries with it a real set of dangers and NIFRS wants everyone to enjoy their summer but not to become complacent about their fire safety or general safety if they are on holidays or away from their usual routine. “If you are, camping, caravanning, boating or enjoying the countryside ensure you, and the people you are with, know what to do in the event of an emergency. NIFRS is also making a fresh appeal for everyone to recognise the very serious consequences that deliberate fire setting in the countryside can have on the Fire & Rescue Service and the whole community. NIFRS Group Commander Mark Smyth continued: “Often the dry conditions, like we have seen in recent weeks, can lead to an increase in the number of gorse fires we attend. Sadly, the majority of these are started deliberately and I am asking the whole community to be vigilant over the coming months for anyone starting fires deliberately and any suspicious behaviour should be reported to the police immediately. 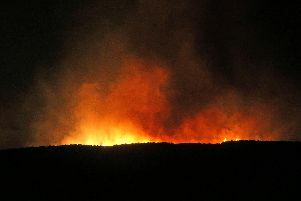 “Gorse fires can also be caused accidentally by something as simple as throwing a cigarette from a car window, leaving a glass bottle on the ground or not extinguishing a barbeque properly. Your seemingly innocent mistake could well cause a severe gorse fire that destroys acres of countryside and ties up firefighting resources for prolonged periods. Further information on summer fire safety and summer safety advice can be found on www.nifrs.org or visit NIFRS on Facebook www.facebook.com/NIFRSOFFICIAL or follow @nifrsofficial on Twitter.